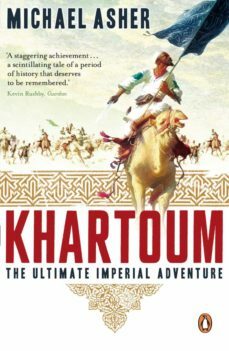 The British campaign in the Sudan in Queen Victorias reign is an epic tale of adventure more thrilling than any fiction. The story begins with the massacre of the 11,000 strong Hicks Pasha column in 1883. Sent to evacuate the country, British hero General Gordon was surrounded and murdered in Khartoum by an army of dervishes led by the Mahdi. The relief mission arrived 2 days too late. The result was a national scandal that shocked the Queen and led to the fall of the British government. Twelve years later it was the brilliant Herbert Kitchener who struck back. Achieving the impossible he built a railway across the desert to transport his troops to the final devastating confrontation at Omdurman in 1898. Desert explorer and author Michael Asher has reconstructed this classic tale in vivid detail. Having covered every inch of the ground and examined all eyewitness reports, he brings to bear new evidence questioning several accepted aspects of the story. The result is an account that sheds new light on the most riveting tale of honour, courage, revenge and savagery of late Victorian times.